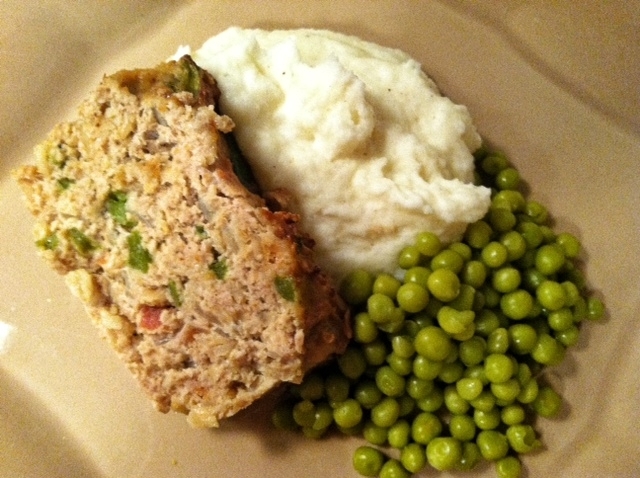 I am not a meatloaf fan but this turkey meatloaf with bacon is really tasty. I have been informed though that if you love traditional greasy beef meatloaf , that you might not be fooled. But it does have bacon and bacon makes everything better. See? It just doesn’t look pretty. But what is does do? It goes well with peas and mashed potatoes. And this recipe is not greasy at all. 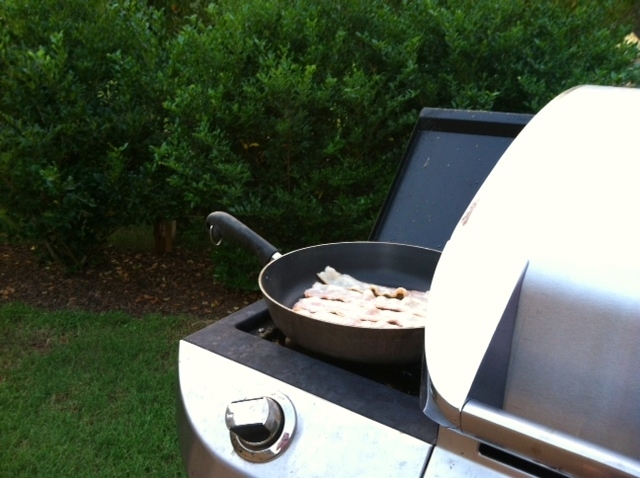 Does anyone else cook their bacon on the side burner of the grill? I love this because then my house doesn’t smell like bacon for two days! Also, the grease doesn’t get all over the kitchen. This is the spot where I will skip posting the picture of the raw meatloaf being mixed. Here is the final product! The oven mitt helps make the picture prettier. And the final “final” product. 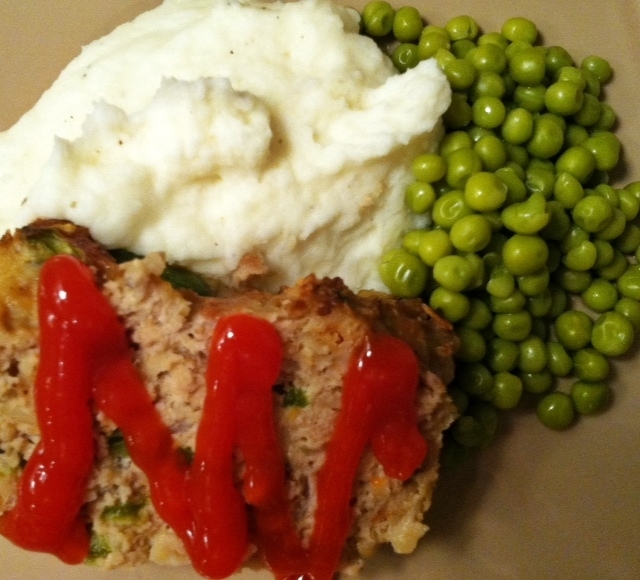 Yes I slather my meatloaf in ketchup. I rarely use ketchup but meatloaf is the exception. Heat oven to 350 degrees. In a large skillet, heat oil over medium-high. Cook bacon, until crisp. Cool and break into large crumbles (Are large crumbles really a thing you ask? Yes) Reserve 1 tablespoon of bacon grease and discard the rest. 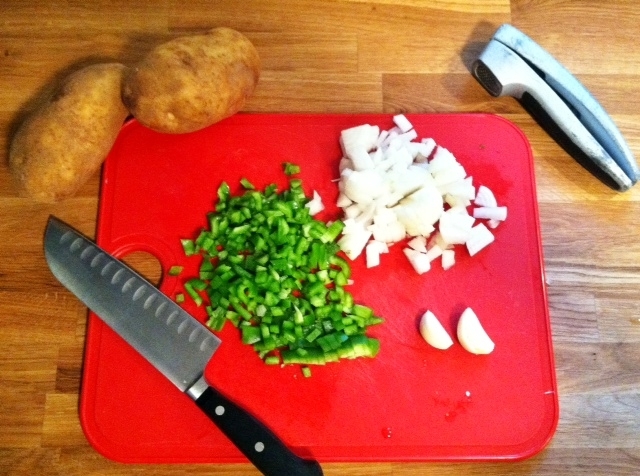 Add onion and bell pepper, season to taste with salt and pepper, and cook until vegetables are soft. Add garlic and cook 1 minute. Transfer mixture to a large bowl and add oats and evaporated milk. Let cool. To the bowl, add turkey, 1/2 teaspoon salt, 1/4 teaspoon pepper (15 twists) , and chili powder, stir well to combine. Transfer mixture to a sprayed loaf pan and smooth the top. Bake until meatloaf is cooked through (an instant-read thermometer inserted in center should read 165 degrees), about 1 hour 10 minutes. 10 minutes before the meatloaf is done, remove and add ketchup design on top then return to oven. Let cool in pan 10 minutes before slicing. 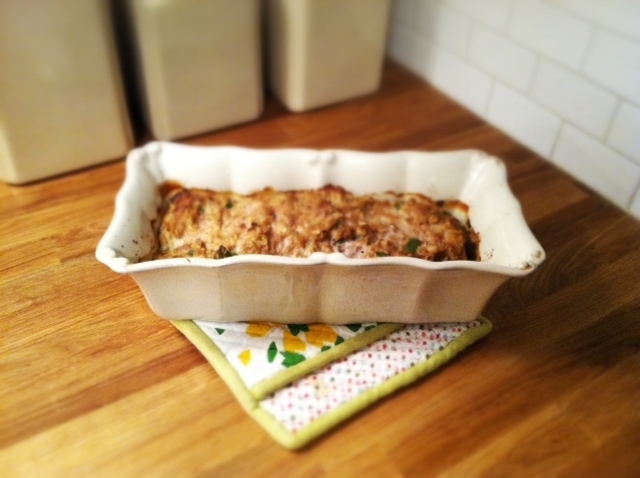 DO YOU DIG MEAT LOAVES?